Snøhetta has been tapped to design a major expansion to the Joslyn Art Museum in Omaha, Nebraska. As one of the city and state’s leading arts institutions, the new Joslyn will become a 21st-century cultural destination with increased gallery space, more public programming, and room for arts education opportunities. The Oslo- and New York-based firm will create a masterplan for the museum with a new building designed to “complement and enhance” the original structures on site: the Memorial Building, built in 1931, and the Walter and Suzanne Scott Pavilion, which was designed by Sir Norman Foster and completed in 1994. Craig Dykers, principal of Snøhetta, is proud to work on a project with such a deep cultural heritage that’s rooted in its geography. “Omaha’s place in the great landscape of the American West is a wonderful inspiration to us,” he said in a statement. “Together with Joslyn’s rich collections of art spanning the globe and its dynamic relationship with the communities that sustain it create a powerful platform to begin designing the next phase of its life, for future generations.” The addition of new galleries to the Museum will allow more room for its growing collections and give existing buildings the space to display art that they previously couldn't. This will include work from the museum's historic and contemporary Indigenous collections, which will be further supported by a newly appointed curator of Native American art. 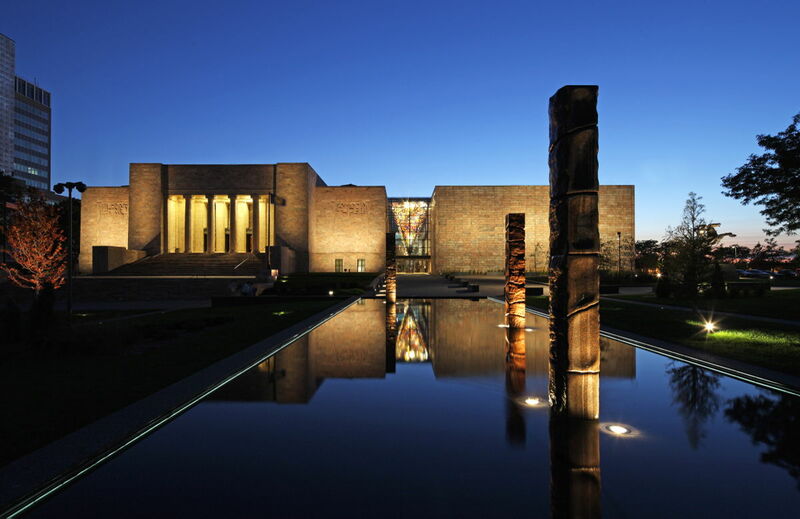 The Joslyn, which is free, has seen an increase in admission over the past decade. This expansion may help bring it even more into the global stage of 21st century art institutions. The City of Omaha is getting a completely new neighborhood. Currently going by the name of West Farm, the construction of the 500-acre development has begun. Like no other development in the state, West Farm is being helmed by developer Noddle, with master planning by Omaha-based HDR Architects, and the latest designs by San Francisco-based SB Architects. Though located at the edge of the city, West Farm is planned to be distinctly pedestrian-oriented. At the heart of the project is an outdoor mall, which is buffered by retail, restaurants, entertainment, as well as smaller plazas and walkways. While the land is being completely transformed, 120 of the site’s original trees are being saved to be replanted as the project completion allows. In all, roughly 20 percent of the project will be dedicated to walking and biking paths, parks, water features, and open space. The project will include 2,100 housing units and over 2 million square feet of office space, retail, and entertainment. 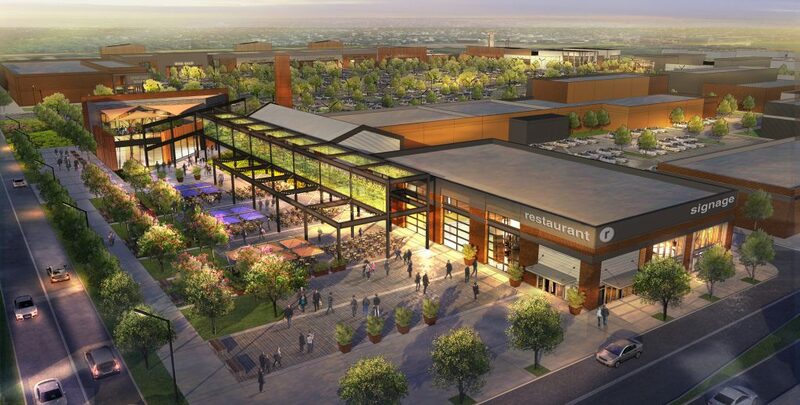 The developers anticipate that the project will have upwards of 15,000 residents, workers, and shoppers on the site daily. In order to finance roads and sanitation for the project, the city has established a sanitary and improvement district (SID). Under the designation, tax-exempt bonds can be sold to raise funds for new infrastructure, and special taxes can be set for the area. In the past, once the debt of the district has been paid down, Omaha annexes the area. Over the next 15 years, Nebraska will join the likes of Texas, California, and Florida, other states that are all home to massive mixed-use developments. And like those mega-developments, West Farm will come at a cost of over a billion dollars. The transformation of millions of square feet of land and the building of an entire community takes time, and no small amount of money. The University of Nebraska Medical Center has recently completed an addition to the Buffett Cancer Center. The Chihuly Sanctuary is part of the center’s healing garden and provides a space for patients and staff to meditate and reflect. Designed by famed glass artist Dale Chihuly, the sanctuary sits in an upper-level roof Healing Garden yard on the fourth floor of the ten-story building. The undulating glass enclosure is filled with ten site-specific art installations of Chihuly’s colorful glass sculptures, as well as a series of glass on glass drawings. "With a background in architecture, I’ve always been interested in space and light. I also love glasshouses, and I thought this type of structure would be an appropriate extension of Leslie’s Healing Garden,” said Chihuly in a prepared statement about the motivations behind the design. "My goal is to provide clear views into Leslie’s Healing Garden and to create a space for caregivers, researchers, and patients to meditate or to find a moment of peace." At the heart of the space, a large glass-filled conical form is reminiscent of the 17th-centruy British red house class cone hot shops that were once used for glassmaking. The bright conical space's focal point is filled with reflected and refracted natural light, using the sanctuary's lightly fritted glass to soften it as it enters. This fritting is also a reference to Chihuly’s Basket series. 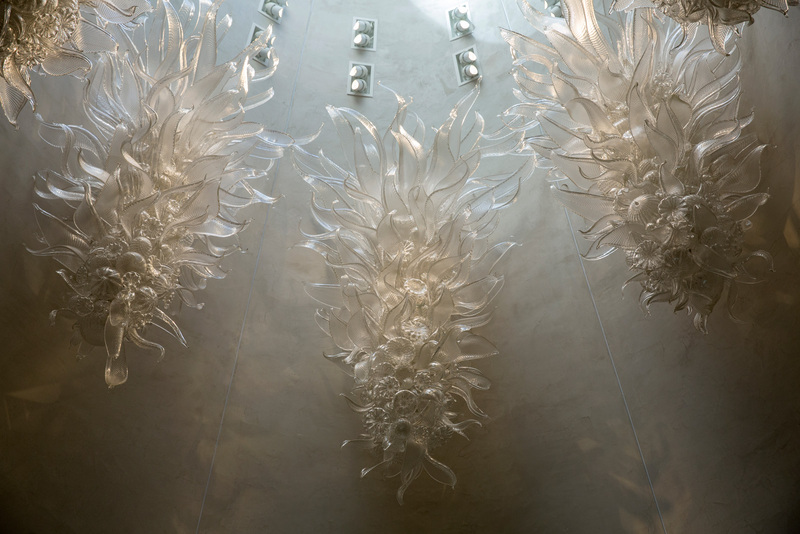 The form of the building as a whole, and brightly colored roof line, were inspired by Chihuly’s Macchia Series. The project’s position in the larger building, along with its curving form, make it highly visible from many points throughout the center. The Chihuly Sanctuary is part of the campuses larger Healing Arts Program, which displays art across the entire medical center. "The physical art in the Fred & Pamela Buffett Cancer Center is only the beginning," said Amy Jenson, executive director of the Healing Arts Program. “In the fall, we will be offering a number of therapeutic programs to build on the patient, family and staff experience.” "A cancer diagnosis is one of the most profound experiences a patient can have,” added Daniel J. DeBehnke, M.D., M.B.A., CEO of Nebraska Medicine. "Numerous studies show the arts can have an important impact on the healing process. That’s why the Healing Arts Program exists – to provide patients, their families and our staff a compassionate, supportive and inspirational environment." In Omaha, Nebraska, developers have plans for a community that's almost as big as the prairie sky is wide. Curt Hofer of Jasper Stone Development is bringing a $1.2 billion "gateway to western Omaha" that includes retail, residential, offices, and green space, the Omaha World-Herald reports. Jasper Stone is partnering with planners at HOK to realize the project. The 180-acre planned community, christened Avenue One, would sit near 192nd Street and West Dodge Road, in an area that is now mostly suburbs and farmland. The Omaha Planning Board gave preliminary approval for the project last week. A seven-acre central plaza would anchor the development, which is focused on health for people of all ages. 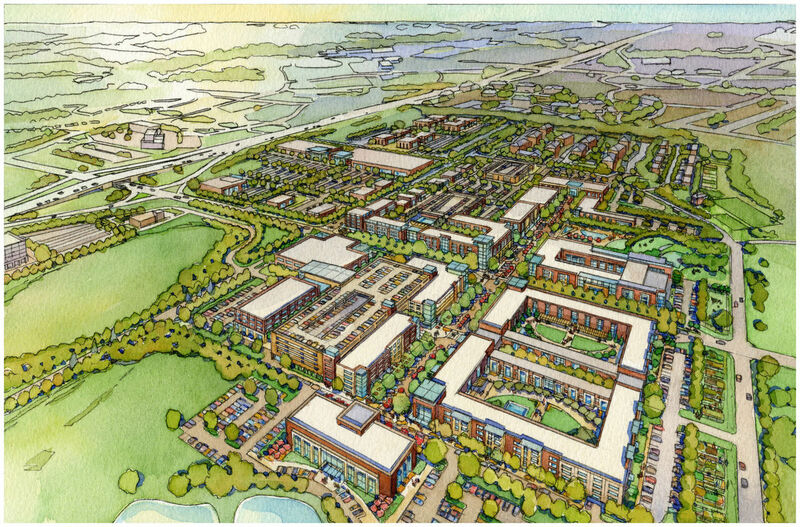 The project will feature over 2,000 residential units and 1.3 million square feet of commercial space connected by 26 acres of open space and laced with six miles of walking and bike trails. Pending final approvals, Avenue One will take 15 years to build. 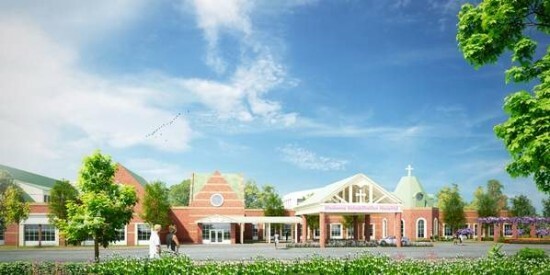 The project is expected to break ground later this year, and phase one should come online in 2018. HOK, a global firm with four Midwest offices, has realized a number of projects in the region over the past year. In Missouri, the firm is designing a 20,000-seat MLS stadium for the Saint Louis FC, and in the same city, HOK is tending to the new GROW pavilion at the St. Louis Science Center, designed in collaboration with Arcturi. In Michigan, HOK completed a light-filled courthouse for the city of Kalamazoo, and across the lake, the firm is designing an interdisciplinary physical science research center for the University of Chicago. The American Institute of Architects has announced the winners of the 2013 Small Project Awards, a program dedicated to promoting small-project designs. Since 2003 the AIA Small Projects Award Program has emphasized the work and high standards of small-project architects, bringing the public's attention to the significant designs of these small-projects and the diligent work that goes into them. This year's ten winners are grouped into four categories: projects completed on a budget under $150,000, projects with a budget under $1.5 million, projects under 5,000 square feet, and theoretical design under 5,000 square feet. CATEGORY 1: These three recipients had to complete small-projects constructions, objects, an environmental art, or architectural design with a budget of $150,000. Bemis InfoShop Min | Day Omaha From the AIA: "More than a new entry and reception area for a contemporary art center, the InfoShop is a social condenser and transition space between the city and the galleries. With increasing emphasis on social and environmental issues, the art center is becoming a laboratory for ideas rather than a repository for artifacts." The jury commented: "This is such a remarkable process! It represents a designer's victory as opposed to an ideologically born, experientially rich element. ... A context is built on triangular patterns cut into a wall of panels and beautifully engages a sculpturally reception desk that double as a bar for entertaining. The reception space looks great, effortlessly orients the visitor and functions very practically. It is playful without being whimsical. This project is an exemplary demonstration of craft in the digital age." Cemetery Marker Kariouk Associates South Canaan, PA From the AIA: "Before dying, a woman left a note for her children to be read after her death. This note was less a will (she had nothing material to leave her children) than several abstract wishes for them. The sole request on her own behalf was that her gravesite becomes a garden." The jury commented: "This is a design that embodies the idea of ‘remembrance’. The bronze plates, graced with a deeply personal and poetic message, are organized beautifully—pushing and pulling you through the space as you engage it. This is respectful, celebratory work that gracefully merges with its landscape and poignantly reveals the spirit of a woman." Studio for a Composer Johnsen Schmaling Architects Spring Prairie, WI From the AIA: "An unassuming structure nestled into a rural Wisconsin hillside, this intimate retreat serves as a studio for a Country Western musician to write his work and reconnect with nature." The jury commented: "The wood detailing, the use of color, and the simplicity of this retreat for a musician is inspiring. An inspiring place in which to create music and commune with nature. The color palette is at once animated and subtle." CATEGORY 2: These three recipients had to create small-project constructions with a budget of $1,500,000. Nexus House Johnsen Schmaling Architects Madison, WI From the AIA: "This compact home for a young family occupies a small site in a historic residential district in downtown Madison, Wisconsin. Successfully contesting the local preservation ordinance and its narrow interpretation of stylistic compatibility, the house is an unapologetically contemporary building, its formally restrained volume discreetly placed in the back of the trapezoidal site to minimize direct visual competition with its historic neighbors. The jury commented: "This is absolutely beautiful. It is well detailed and not overwhelming. It fits fantastically into the surrounding neighborhood and doesn’t take away from the other architecture. As the name Nexus suggests, this house is very well connected. Composed of a brick podium and a wood clad block on top, it masterfully accomplishes a variety experiences in a compact footprint." Pavilion at Cotillion Park Mell Lawrence Architects Dallas From the AIA: "Commissioned by the Dallas Parks Department, this new shade structure bridges the gap between two groups of trees at a natural gathering place in the park." The jury commented: "This is such a fantastic way for the public to be able to experience architecture in a park setting. The whimsical pop of red draws the eye and leads to you walk in and experience the space. It plays with light and provides a shading experience. An exquisite filigree steel structure, that is at once shade pavilion and large environmental art piece." Webb Chapel Park Pavilion Cooper Joseph Studio Mission, TX From the AIA: " We were asked by the Department of Parks and Recreation to create a picnic pavilion to replace a decaying 1960s shelter. Given Texan heat and humidity, climate control was a priority." The jury commented: "Cleverly integrated into the site the side berm and concrete overhead create a thermal cooling mass the way sustainable design traditionally did. This pavilion project is unlike anything we have seen before. A beautiful public work that will surely inspire those that experience it to embrace architecture in a new way." CATEGORY 3: The three recipients in this category had to complete a small-project construction, object, an environmental art, or architectural design under 5,000 square feet. These projects had to be designed as well as constructed, fabricated, and/or installed majorly by the architect. 308 Mulberry Robert M. Gurney, FAIA Lewes, DE From the AIA: "The starting point for this project is small house at 308 Mulberry Street, originally constructed in the early nineteenth-century in the heart of the historical district of Lewes. In the redesign, the exterior of the original structure is meticulously restored." The jury commented: "A demanding redesign that respectfully preserves the original architecture, while artfully transforming the home." Nevis Pool and Garden Pavilion Robert M. Gurney, FAIA Bethesda, MD From the AIA: "Located in a neighborhood bordering Washington, DC, this suburban site has the advantage of being located adjacent to woodlands. A contemporary house surrounded by mature trees and manicured gardens anchors the site. A new swimming pool, stone walls, and terraces behind the house organize the rear yard and establish a dialogue between the existing house and a new pavilion." The jury commented: "A suburban backyard is transformed with a new panoramic awareness of water, forest and sky." 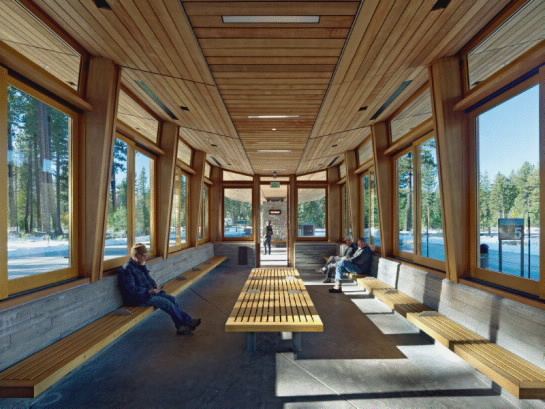 Tahoe City Transit Center WRNS Studio Tahoe City, CA From the AIA: "The Tahoe City Transit Center (TCTC) represents a vital step toward achieving a more sustainable transportation network within the region." The jury commented: " This is first class design and craftsmanship that works on many levels. The scale of the bus is tamed. The project is reminiscent of the approachable architecture of the early century. The wood siding and trees in the background integrate very well. The design is modern and vernacular at once. This profound piece of public infrastructure serves a very important civic function with a low impact modest foot print." CATEGORY 4: The recipient in category 4 was challenged to draft a completely original architectural design that is purely hypothetical and theoretical, and less than 5,000 square feet. Four Eyes House Edward Ogosta Architecture Coachella Valley, CA From the AIA: "A weekend desert residence for a small family, the Four Eyes House is an exercise in site-specific "experiential programming". Rather than planning the house according to a domestic functional program, the building was designed foremost as an instrument for intensifying particular onsite phenomenal events." The jury commented: "The imagery is expertly rendered and communicated. Both rational and lyrical and possessing excellent spatial quality. Architectural towers and horizontal lines modulate the viewer's experience and connection with an elemental landscape. It redefines how a home should be built. ... This project takes the experience of place and via an ‘architectural amplifier’ of thoughtful movement (ascension into each bedroom space) and choreographed view capture / light receiver (well-placed windows), makes it a triumphant celebration of humankind situated in the center of the natural universe."